Newport is located in Newport County, in the State of Rhode Island. Newport is both a military and well-known tourist area. For decades, travelers know that Newport County is a small corner of New England with big surprises. The number of attractions, museums, historic sites, bus, boat and walking tours, plus arts and cultural events, festivals and galas keep visitors in a whirlwind of activity. Examples include International Hall of Fame, Newports 19th and 20th Century Mansions, Cliffwalk, and the Annual Jazz Festival. Newport is considered a high cost living area compared to other towns in the State of Rhode Island. NAVSTA Newport does not have a base operator, contact the Fleet and Family Support Program for base and local information, 401-841-2283 or DSN 312-841-2283. Newport is the Navy's premier site for training officers, officer candidates, senior enlisted personnel and midshipman candidates, as well as conducting advanced undersea warfare and development systems. Naval Station Newport's mission is to fulfill the diverse requirements of its tenant commands by providing the facilities and infrastructure that are essential to their optimum performance. Naval personnel assigned to Newport arrive from all parts of the United States and many free nations of the world. The naval installation mirrors a miniature America, flavored with an international touch. The Navy's economic impact in Rhode Island is legendary. For many years, it was the state's largest single employer, both in terms of personnel and payroll. Today, it is still the largest single employer in Newport County and third overall in the state. Newport is home to the Navy's most prestigious educational institution, the Naval War College. As the oldest institution in continuous existence anywhere in the world, the college is organized to pursue and integrate both academic and research endeavors. Each year, over 500 outstanding mid-career level officers of the Navy, all other US services, civilian federal agencies and international naval officers come here to pursue a rigorous ten month course of post-graduate studies following in the footsteps of such notable War College graduates as ADM Chester Nimitz, Rear ADM Alan Shepard, first American in space, ADM Robert Fallon, Commander, US Central Command and others. 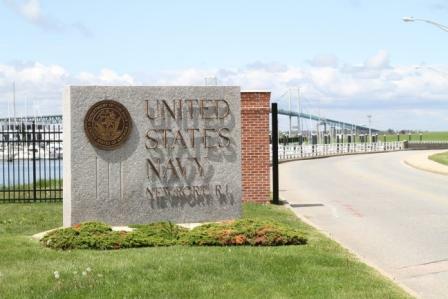 Naval Station Newport’s Mission Statement: The mission of Naval Station Newport is to fulfill the diverse requirements of its tenant commands by providing the facilities and infrastructure that are essential to their optimum performance. NAVSTA Newport will ensure that the highest standards of the Navy are incorporated into its efforts; that all tenant commands will benefit from its continuous improvement; and that all hands will work together to earn and maintain its reputation as the Navy's world-class Center of Learning Excellence. Naval Station Newport’s Vision Statement: The vision of Naval Station Newport is to be a world-class Center of Learning Excellence with the capacity to support the Navy’s mission by providing warfighters with education; training; Research, Development, Training and Evaluation (RDT&E) and development capability to meet today’s demands and exceed tomorrow’s expectations. There are 486 Officers, 685 Enlisted, 1,030 Reservists, 4,044 Civilians and 2,798 Contractors working at Newport. Average onboard students are 2,068, with an annual throughput of 14,653. Total personnel is 11,111. Take Interstate 95 South to Route 4 South/East to Route 138 East, to Jamestown- Verrazano Bridge. After crossing the Jamestown-Verrazano Bridge, continue on the cross island highway to the Claiborne Pell (Newport) Bridge ($4 toll). EZ-Pass is now used on the Claiborne Pell (Newport) Bridge go to the RI EZ-Pass website to find a plan and purchase. Naval Station Newport can be seen northeast from the Claiborne Pell (Newport) Bridge. After crossing the bridge, proceed to the last exit, "Admiral Kalbfus Road/US Navy Base." At the end of the exit, turn right onto Admiral Kalbfus Road and when you enter the rotary, turn right between Mama Leones Restaurant and the Diner which will take you to Main Gate 1. Take Interstate 95 North to Route 138 East (Exit 3) and take a right at end of exit. Drive 12 miles until the intersection of Rte 138 and Route 1. Take a left on Rt 1 North and then take the Jamestown/Newport exit. After crossing the Jamestown-Verrazano Bridge, continue on the cross island highway to the Claiborne Pell (Newport) Bridge ($4 toll). EZ-Pass is now used on the Claiborne Pell (Newport) Bridge go to the RI EZ-Pass website to find a plan and purchase. Naval Station Newport can be seen northeast from the Claiborne Pell (Newport) Bridge. After crossing the bridge, proceed to the last exit, "Admiral Kalbfus Road/US Navy Base." At the end of the exit, turn right onto Admiral Kalbfus Road and when you enter the rotary, turn right between Mama Leones Restaurant and the Diner which will take you to Main Gate 1. Take Interstate 95 South out of Boston. This will take you to Route 24 South, Fall River, MA. Follow Route 24 South (Fall River/Newport signs) to Route 114 South into Newport. (Route 114 South is called West Main Road in Middletown and Broadway in Newport). Proceed south on West Main Road/Route 114 to Coddington Highway (turn right) and proceed to traffic rotary. When you enter the rotary, turn right between Mama Leones Restaurant and the Diner which will take you to Main Gate 1. No listings found for Newport Naval Station - Newport.